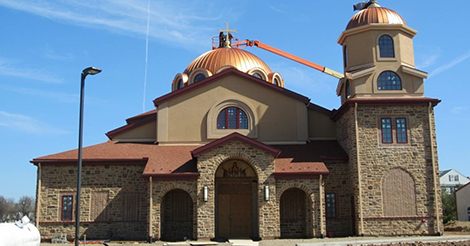 Over the years, we have been blessed to experience a wide range of faith-inspired events during the design and construction of a religious construction project. A few that you are probably familiar with would include groundbreaking and ribbon cutting ceremonies but we also enjoy the rituals that derive from the church, school or company’s core values and mission. Here are a few of our favorites! Lebanon Area Evangelical Free Church. The congregation is blessed with a member that’s a true artisan, Bob Johnson of Iron Nature. In 2001, when their church was going through a building campaign, they adopted a prayer-focus activity that involved nails. Each family was asked to bring home a small bag of nails, take one out each day and pray over the new church and the construction process. Bob was then asked to create something with the nails that would commemorate the building project. In a 2014 article with b Magazine, Bob described the answer that came to him after several weeks of prayerful meditation. The words included forgiveness, truth, love, peace, victory, hope and joy – all basic principles that are the foundation for Bob’s faith. Check out this video on the making of the crown of thorns. Fun Fact! In case you’re wondering about the jar of nails in the foyer of the church… During the most recent construction project, the congregation was asked to pray over more nails, but unfortunately, they were the wrong kind of nails, so they couldn’t be used for the new building or for another cross. However, they are now lovingly kept in a big jar in the foyer! State College Alliance Church. Before our first Master Planning meeting, the Building Committee at State College Alliance Church asked if they could pray for our team and for us to pray for their congregation. We continue to have a prayer time prior to every meeting seeking God’s wisdom for everyone involved in the project. Greek Orthodox Church Valley Forge. During the construction of the church, we participated in the ceremony for the blessing of the crosses when they were installed on the domes! We have also had several churches, retirement communities and schools organize an event where the congregation, residents and students are encouraged to write messages of encouragement on a portion of the walls or the “final” beam that will be placed on the project! Keep these in mind for your next religious construction project… you are only limited by your imagination!